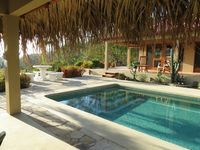 Property 6: Beautiful, Contemporary Private Art/Yoga Retreat Home In Paradise! Property 22: Unmatched Ocean & Mountain views! Pool! Private cook/cleaning included! Ocean and Mountain view! Villa Secret Paradise: private pool! Property 43: Ocean and Mountain view! Villa Secret Paradise: private pool! We had a great stay at this secluded place on top of the hill. Samara town only 5 min away with car. Amazing sunset view and wildlife close by with a black hawk nest just meters away. This villa was excellent! The living space was huge and modern! Easily slept 6, even though there were only 4 of us. My favorite part was a huge screened in solarium at the back. Great for checking out the birds and monkeys, but avoiding the bugs! A 5 minute walk to the beach and a 5 minute drive to each nosara and playa Guiones. The surf at playa guiones was a hit with my husband and daughter, we highly recommend renting boards from coconut Charlie's, the guys there were very helpful and accomodating. A nightly walk along the beach took us to olga's where we could enjoy a cervasa and watch the sunset. The villa itself had everything we needed and hans, the property manager was lovely and was always available to help if we needed anything! I highly recommend this place if you want to relax and enjoy and the amenities required! Thanks, hans!! !